A satellite with an atmospheric tether attached will slow down due to aerodynamic drag. For atmosphere probing this is a disadvantage, but it can be used to make an orbiting satellite return to Earth. A spacecraft could deploy a tether into the atmosphere so that the drag on the combination, however small, would eventually decelerate the satellite sufficiently for it to fall back to Earth. This can be used for capsules with microgravity experiments onboard that need to be examined in a laboratory on Earth, or to remove obsolete satellites from orbit (in which case the intense heat that is generated when the spacecraft slams into the atmosphere is simply allowed to burn it up). Spacecraft currently returned to Earth without tethers need rocket propulsion systems and considerable amounts of propellant. Instead of decelerating a spacecraft so that it completely falls out of orbit, tethers can also be used to slow it down only a little bit. Space probes flying to other planets using efficient (Hohmann) transfer orbits arrive at their destination with too much speed. Without slowing down, they would fly past instead of entering orbit around a planet. However, decelerating with rocket thrust uses a lot of propellant and thus adds considerable mass to a space probe (early interplanetary probes such as Pioneer 10 and 11 and the two Voyagers were not equipped with sufficient propellant to slow down, and thus visited their targets for only brief periods during fast flybys). Close to the target planet, an interplanetary spacecraft could roll out a long tether into the upper atmosphere. 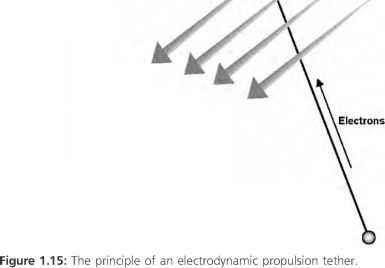 This would decelerate the spacecraft to a speed lower than the local escape velocity, so that it would no longer have the energy to fly away from the planet. Once the right velocity has been reached, the tether could be cut and the spacecraft would remain in orbit— all without using any propellant.